Computer simulation is widely-used in investigating the performance of existing and proposed systems in many areas of science, engineering, operations research, and management science, especially in applications characterized by complicated geometries and interaction probabilities, and for dealing with system design in the presence of uncertainty. This is particularly true in the case of computer systems and computer networks. Therefore, it is very important to have efficient, reliable, and accurate methodologies for simulating these systems to ensure effective, reliable, and accurate evaluation and analysis of performance and to create the optimum design parameters for communication and computer networks. Although practical experiments and simulations are the most widely used, several efforts have also been directed towards mathematical models. 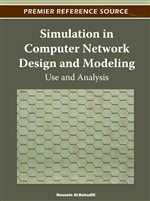 The main objectives of this chapter are to: present the methodologies and techniques used to evaluate and analyze the performance of communication and computer networks routers, such as mathematical analysis, computer simulations techniques, and empirical measurements; identify the workload required for accomplishing a simulation model or mathematical analysis; identify the main metrics used to evaluate, manage, and control the performance of the computer networks; present the advantage and disadvantage of these techniques; and identify the challenges facing these different methodologies. The problems related to performance issues are regularly not brought in premature time for the design stages. From beginning to the end of the tuning stages, not all design phases matters are always repaired. Designing issues is not always possible for the best solving techniques and they are usually very expensive and not professional. Resource utilization (CPU, memory, disk I/O, and network I/O). The next step after getting the performance metrics results is to analyze these results to build your vision for the resources, difficulties, and limitations. Does the design support performance goals? How to know that you are on the map for achieving your performance goals. Knowing that design decisions are influenced by performance and the constraints performance puts on future design decisions. Frequently, these decisions if not captured, can lead to huge maintenance efforts that work against your original goals. When your appliance is released you stay away from disclosures in terms of performance. At the end of the day performance turns out to be a component of your design. Most performance modeling techniques has history since 1947, based on continuous-time perceptions, and discrete-time approach. Discrete-time approach is considered and used in computer communication networks, where the time span is divided into slots of certain length, and packets are allowed to arrive at the beginning of time slots and depart at the end of time slots. On the other hand the continuous-time perceptions, the basic time unit can be used to reflect such things as time slotting in the physical system, and which they consider thorny to submit an application to digitized computer communication networks.